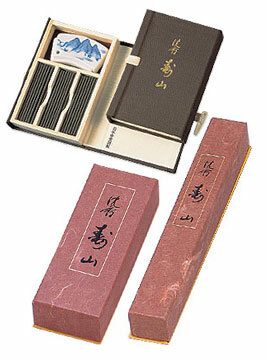 Superior quality Japanese aloeswood incense sticks packaged in a paulownia wood box, for moisture protection, with a blue and white ceramic holder. Exceptional incense in an elegant package. 4 1/4 x 2 7/8 x3/4 in. Superior quality Japanese aloeswood incense sticks packaged in a paulownia wood box, for moisture protection, with a blue and white ceramic holder. Exceptional incense in an elegant package. Jinkoh is the Japanese word for aloeswood, an exotic and aromatic wood of an evergreen tree native to Northern India, Laos, Cambodia, Malaysia, Indonesia, and Vietnam. Aloeswood is used by Traditional Chinese, Unanai, Ayuravedic, and Tibetan physicians as well as in the production of exceptional qulity incenses. Aloeswood is the most precious, rare incense on Earth. Since ancient times it has been so difficult to procure, and there is so much demand for its sophisticated fragrance, that often Aloeswood has been traded on an equal level with gold. Highest grades are known as Jinkoh & Kyara in Japan, Agarwood in India, Eagle Wood in Korea and Southeast Asia, and Lingum Aloes in Magickal formulas. In ancient Sanskrit texts from 3000 B.C., it was known as Aguru. The palaces of the city of Dwarka all had the scent of Aguru (Aloeswood) wafting from the windows and entryways. Lord Krishna's hands bear the scent of Aguru. Lord Buddha was to have said that the fragrance of Aloeswood is the 'Scent of Nirvana'. Since ancient times, Aloeswood has been gathered from the dense rainforests and jungles of Southeast Asia. Certain trees fall in the forest and after many centuries of being covered up by the sediment of the jungle solidify into an unequalled fragrant resin. Your incense was popularized again, in 800 A.D., in the Imperial Court of Japan. Samurai Warriors scented their armor with its smoke, for luck, before going into battle.